The creature had just woken from hibernation in the remote Kuril Islands, Russia. In the nerve-wracking footage the riders taunt it before it begins to give chase. The pursuit lasts 40 second before the animal rises up on its hind legs, towering over the snowmobile. The animal bears its teeth and brandishes its claws. But the unidentified driver is too quick and speeds away from the potentially fatal encounter. 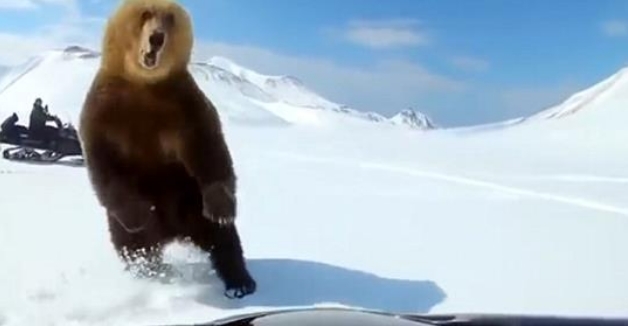 The video has sparked fury on the Pacific rim of Russia where such bear chasing stunts turn the animals into future killers. Danila Dudarev, deputy forestry and hunting minister in the Kurils, called the baiting 'outrageous'. 'This bear is not dangerous,' he argued. He said the bear could attack a helpless human in the future. He told The Siberian Times: 'This animal might now throw out its aggression on someone who will not be able to leave on a snowmobile. In April and May, bears go out from their dens. 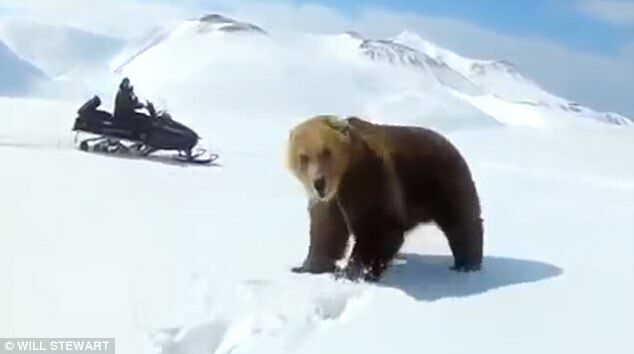 Responses to "Angry bear rears up at cruel snowmobilers who have woken it from hibernation"